If you don't already know, I am a bit of a nut when it comes to species at risk. I enjoy learning about them and seeking them out. Additionally, I love species that have interesting adaptations or a quirk in their life history. If you can roll those two into one species, then you can be sure I am very eager to search for it! One species that has a certain mystique to it in British Columbia is Johnson's Hairstreak (Callophrys johnsoni). Hairstreaks are a personal favourite in the butterfly world as it is, but Johnson's isn't content just having that going for it. Instead, it has evolved a very intricate life history that just seems so improbable. 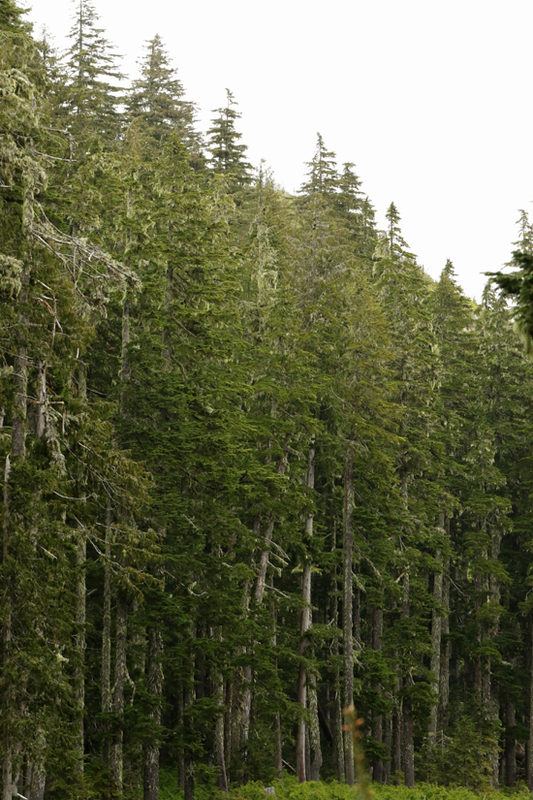 The species is an old-growth conifer forest obligate because it's larval host plant is mistletoe (genus Arceuthobium). I can't even fathom how long a relationship like that takes to develop - mind blown! Needless to say, Johnson's Hairstreak has topped my most wanted butterfly list for years. On May 10th, Devon Parker and his father, Michael, drove up above Jordan River to one of their favourite areas to search for butterflies. They had a great trip and when they got back Devon sent some photos to Jeremy Tatum to put up on the Invertebrate Alert. The next day, I viewed the photos and noticed the butterfly labeled as a Cedar Hairstreak looked very peculiar. Our Cedar Hairstreaks are usually a rich orange-brown with an almost lavender-coloured wash and they have a jagged, white postmedial line, whereas the butterfly on my computer screen was a light chocolate brown and had a much straighter postmedial line. I immediately did an image search of Johnson's Hairstreak for comparison and was shocked that the two photos had all the same features going on. I was in disbelief. I immediately fired off an e-mail to Jeremy Tatum hoping to get his input, but I wanted to get a response fast so I also fired off e-mails to a couple other respected BC lepidopterists. Luckily Cris Guppy put my mind at ease quickly - it was indeed a Johnson's Hairstreak and he had already been directed to the photos by James Miskelly. It's good to know we have a community that will catch these exciting finds! 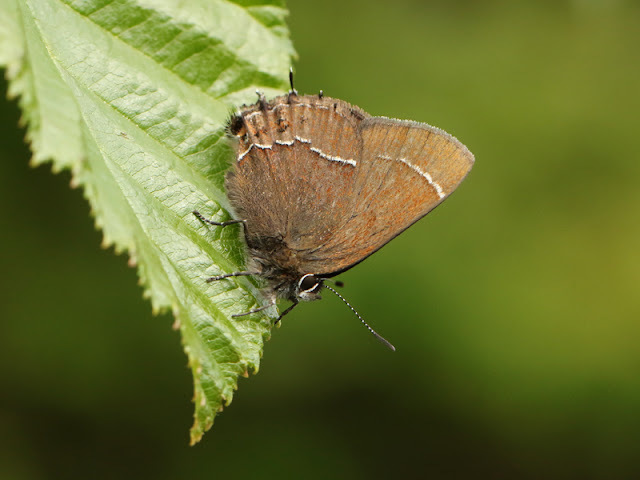 I got a little history lesson on the Johnson's Hairstreak records on Vancouver Island. I knew they had been documented on the Island, but I figured they had been extirpated because of the extensive clearcut logging that has left only fragments of awe-inspiring old-growth forest. The three historical records, provided by James Miskelly on the BCButterflies Yahoo Group, are: Shawnigan Lake (1925), Robertson River (1959), and Nitinat Lake (1970). Cris Guppy added a little more information, which I found to be quite interesting. The Shawnigan Lake record was a specimen record of an adult caught on June 17th, while the Robertson River and Nitinat Lake records were reared specimens. The Canadian Forest Service had a program that lasted decades, which involved beating trees, collecting the larvae that fell, and rearing them to determine which species were defoliating forest resources (conifers). The reared specimens mentioned above came from this program. Johnson's Hairstreak is truly an enigmatic species on Vancouver Island and it`s exceedingly exciting to have a record after not being recorded for more than 45 years! After Cris Guppy confirmed the record, I tried to get in touch with Devon about the location. I was starting to get anxious because the weekend was rapidly approaching and I thought it might be my only chance to attempt to find one this year. Luckily, I got a text on Friday afternoon asking if I'd like to join Devon, Michael, and Jeremy Tatum on a trip the next day up to the area to look for the Johnson's. I jumped at the opportunity! We met at 10:00 a.m. and headed right out to Jordan River. Out of respect for Devon, I won't disclose the location. I would just suggest getting out to the Jordan River area and exploring some logging roads. Some patches of older cedar-hemlock forest have not met chainsaws yet and I think there is potential that Johnson's Hairstreak could be found more extensively. We arrived at the spot a little before noon and we started to search the roadside vegetation. Shortly thereafter, Jeremy Tatum exclaimed something along the lines of "Brown butterfly overhead! Small!" I looked up to see a hairstreak-sized butterfly arcing over and landing on a blueberry shrub. It was in a bad spot, but I leaned forward and saw tails... it was a hairstreak! Just like that, we were glimpsing a butterfly I had thought was extirpated... a ghost. I had chills. But that was all that individual gave us for looks. It rose back up and we lost it against the old-growth coniferous backdrop. Luckily, it wasn't long before another (or perhaps the same one had doubled back) was found nectaring on a roadside willow. This was pure bliss. This one was approachable and allowed me to get very close, but it was a miserable model! It only offered split second profile views and I kept missing the shot, but I got some decent ones in the end. Occasionally we would briefly get our hopes up that we had found another one, but every time it turned out to be Western Pine Elfin. I am okay with that! I returned a couple times the following week and unfortunately the weather did not cooperate. I did, however, remember to take some habitat shots and I was excited to find Hemlock Dwarf Mistletoe (Arceuthobium tsugense) up in one of the roadside hemlocks. I am grateful to Devon and Michael Parker for not only getting out and exploring areas that have not received adequate butterfly surveying in recent years, but also for extending the invite out to me and Jeremy Tatum to join them on a return visit. I will return to the area in future years to try to find more sites this highly specialized butterfly persists on Vancouver Island and hopefully get a better sense of its local status. I think it's important to add a note about the implications of a local find of this magnitude. 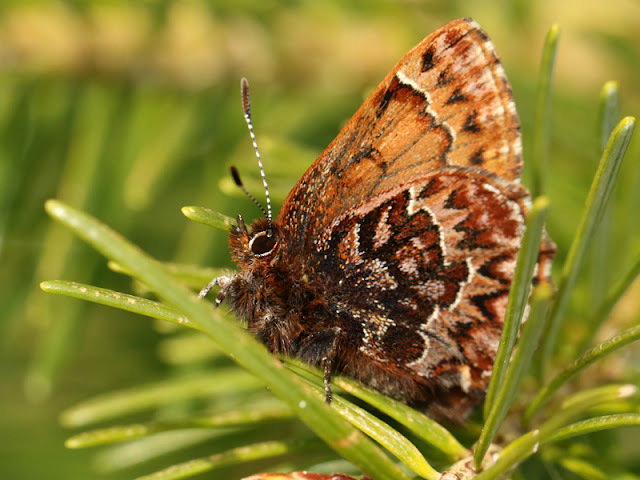 We have lost several butterfly species, including some regional endemic subspecies, on Vancouver Island over the last century, including: Silver-spotted Skipper (Epargyreus clarus ssp. californicus), Island Marble (Euchloe ausonides ssp. insulanus), Taylor's Checkerspot (Euphydryas editha ssp. taylori), and Island Blue (Plebejus saepiolus ssp. insulanus). 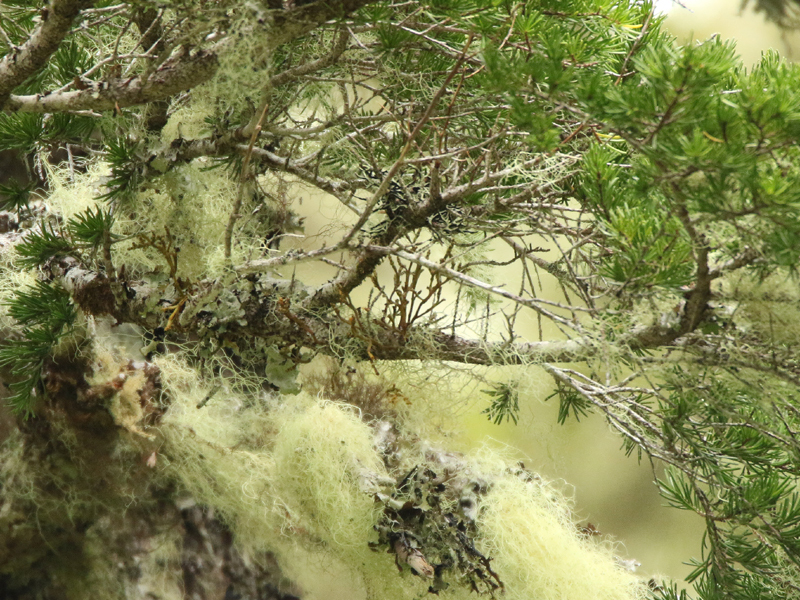 The latter was a Vancouver Island endemic subspecies and has not been recorded since 1979. 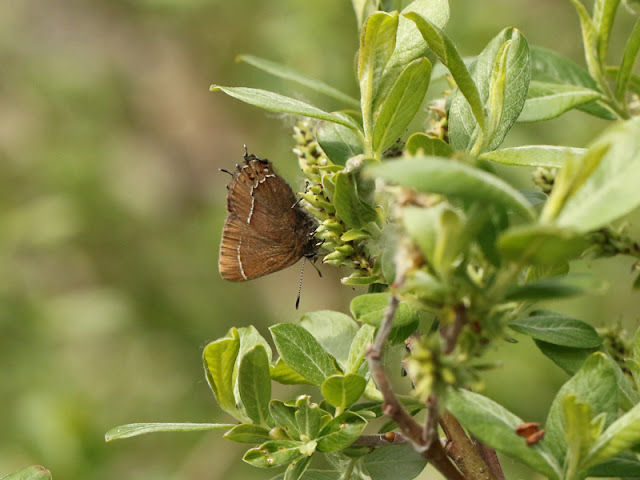 Rediscoveries like the Johnson's Hairstreak sighting provide a glimmer of hope that some of those species thought lost might persist out there and it just takes a bit of luck and the right set of eyes. I wouldn't mind if that set of eyes happens to be mine, but I'd just be happy to learn we haven't let another taxon fizzle out.